That was the verdict of the jury of four men and five women in the trial of Edward "Al Capone" Green, 70, of Morne Daniel for the murder of Damian Dorival, 35, of Roseau in 2008. The jury returned their verdict, one absorbed quite calmly by the gallery, on Wednesday July 17, 2013 at 4:35pm at the Roseau High Court. The case, which begun on June 17, 2013 had gone on for 12 days over five weeks. The jury heard evidence from 31 witnesses including one by the defence, listened through more than six hours over two days of addresses (by Keith Scotland for the prosecution and Darius Jones for the defence, and summation of the evidence by trial judge Birnie Stephenson); then after three hours of deliberation the jury decided that Green was guilty of murder. Green did not have to make a defence. His position is that he is innocent. Before the verdict, as he addressed the court from the Prisoners' Dock for about 55 minutes, Green gave an outline of his daily routine. He said he usually spends his day in Mahaut where he has many friends and children. (Green has 29 children). He had been disabled for over 15 years and had not driven for that period. He described his home at Morne Daniel as a free port. "I have an 18-bedroom house. I rent some of it or I give fellas a shelter. Everybody comes there to my boys, and do what they feel like. When I buy food stuff I buy by the full load. I always have meat and I buy rice by the 100lb bag at a time. I cook rice and back & neck, pelau. Many times coming to my home I have seen many people sleeping there; and I had no problem with that because I have a lot of space," he said. He said he had a licensed firearm for over 50 years. "I couldn't be so stupid to use a gun and put it back the same place where it was all the time. Anybody could come at my home and use my gun and put it back, because the most time I spend at my home is about six hours," he said. "Somebody must have come in and the gun went off. I am being accused falsely again. I am a very easy-going fella". Green said he bought that gun at Astaphan for $60 about 50 years ago without a licence because it was cheap. He reasoned that he needed the firearm because he had an estate of 198 acres at Wotton Waven at a place called Long Deacon given him by his father. At one stage he wanted to bring the gun to the police because he had no use for it. "I have no strength so I cannot be violent," he added. "I had no need to find myself in any form of dishonesty because I have a lot of land at a place called Ti Paradis bounding with Glasgow and River Estate, and I had fellas harassing me day and night for me to sell land to them". Green added: "I am innocent of this charge. I am not saying my gun was not used, but it wasn't used by me, because I am not so stupid to use a gun on a man and put the gun back the same place. I don't know what they are trying to insinuate. They are painting a picture that does not look like me at all. All people will say about me is, I like Red Cap and I like talking nonsense. That picture they are trying to paint of me, I am innocent of the fact. If they said, I like eating a lot… if I eat half a container then you can believe that; a man to amuse a crowd, I will give them jokes, but I am not violent. I have no reason to lie to you". Green's much- anticipated trial began on Monday June 17, 2013. He was arrested and charged with Dorival's murder, whose headless body was found on Elmshall Road in June 2008. Dorival's head was later discovered in the Palm Grove River. 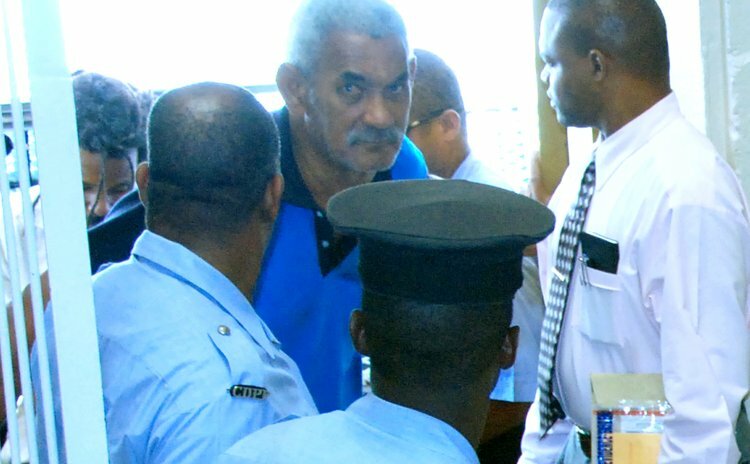 The prosecution argued that Green shot Dorival at his home at Morne Daniel where Dorival was a tenant, dragged the body into a vehicle that Dorival had rented two days earlier, cut off its head, dumped the body near Elmshall and threw the head into the river. The prosecution called 30 witnesses including members of Green's family. After the verdict, Justice Stephenson scheduled sentencing to Friday, September 6, 2013. She ordered psychiatric and social inquiry reports and submissions from the defense to be submitted to the court on or before Monday, August 26. Prosecutor Scotland indicated to the court that given the age and frailty of the prisoner, he would not be seeking the death penalty.